"The true patriot fights and stays alive to help his people become free,"
-- Georghios Vargas, the Assassin in "Pentadaktylos"
1940 they made love on a Cyprus beach. It triggered a terrifying ripple in time for all concerned. A haunting saga of dedicated love, old promises and conflicts of patriotism set in the turbulent Middle East. A British Army officer, Greg Sommerville returns to the Mediterranean Island of Cyprus to discover he has a son from a passionate love affair many years before. Real and terrifying problems surface. His seventeen year old son is now a branded "terrorist" fighting for independence from British colonial rule. Eleni his old love has disappeared. There's more! An old Greek assassin from Salonika has landed on Cyprus. His mission? To assassinate the British Governor along with a mysterious "Third Man" plus sabotage UN talks. The problem is compounded when the officer finds his son has joined the assassin's special team in the mountains which is being hunted by crack regiments of the British Army. Can Sommerville correct history and keep an old promise over what seems incredible odds and get his son and Eleni back together. The saga is set against an actual historical background of Cyprus in its last turbulent days as a British Colony with Turkish Cypriots fighting Greek Cypriots who are in turn fighting the British for their independence. British born author Robert Egby was an international correspondent and award winning news photographer who spent thirteen years in the Middle East, nine of them living on Cyprus. He spent time with both British and Greek Cypriot fighters, experienced first hand the inter-communal riots and killings and reported on most of the background events narrated in the novel. The typewritten manuscript for this book sat in a cardboard box for forty-three years until the summer of 2011 when Robert re-typed and brought it into the digital age. Read part of the dramatic chapter: An Ambulance Ride to Hell or watch Robert talking about his novel on Youtube.com. United States and Great Britain. International readers will also find this printed book at The Book Depository. AUTHOR SIGNED BOOKS: Each of Robert's books are available signed by ordering through Paypal. In the instructions explain who you wish the book or books signed for. Each book is $12.99 with FREE shipping in the US and Canada. Most orders are mailed the same day as they are received. Thanks. Midwest Book Review on Amazon.com. 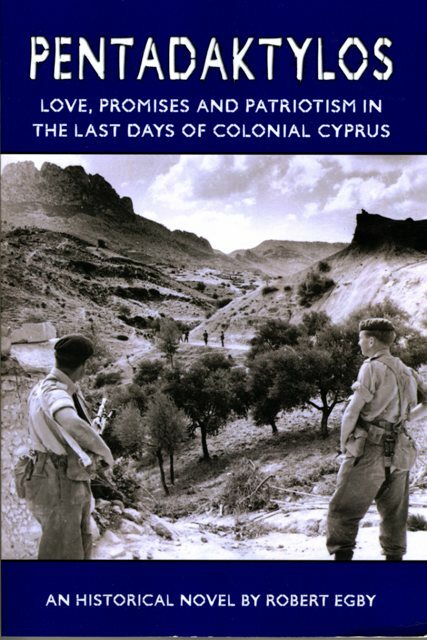 "Patriotism in the Last Days of Colonial Cyprus" is a historical novel following a British Army Officer, two decades after he left the island, returning on its last days. Old romance and its results flare up and the chaos of a people who want their independence rage around him and may cost him his life. "Pentadaktylos" is a fine work of historical romance and adventure, highly recommended." "Until a year or so ago I was resident in Cyprus - having first gone there just after the 'troubles' stopped in 1960. I thought I was an expert in the history of Cyprus until I read Bob Egby's remarkable and memorable story with its wealth of historical fact. The story itself is a tender story of passion and love interwoven skillfully into a taut drama of the times and the terrible atrocities committed in the name of patriotism. A memorable read and fully recommended for those who enjoy an exciting tale with a strong basis in the history of the time." "A unique insight into the mind of a terrorist and a very good tale"
The pace of Robert Egby's EOKA novel set in Cyprus in the late 1950s intensifies as the plot thickens, until it is impossible to it put down! This is a book, which should be taken seriously. It really would translate to the silver screen. Egby can tell a tale and his experience and extensive research shows, as he explores not just the mindset of the island citizens and the occupying British army but also burrows into the minds of the terrorists in these dark days before Cyprus tears itself apart. The books begins with a love affair as WW2 separates a young couple, and is followed by an enigma, who are the two Oxfordians chatting in the embryo Heathrow terminal in 1958 discussing a dam to built in mountain Cyprus? Thereafter each character or couple is introduced in the early chapters and Egby has the skill to bring them all together as plot unfolds to reveal a daring atrocity, which the authorities struggle to foil. Along the way: a child born illegitimately, injury which prevents fatherhood, horrific Stuka raids on undefended hospital ships, and the human need for love pepper the pages. Particularly well drawn are the terrorists born of frustration or simply nurtured with a desire for adventure but whose lives when described by Egby fall short of heroic. All this is set in a landscape as dramatic and as beautiful as the plot is harsh and violent, heightening both aspects of the narrative. The book, particularly in the early stages would benefit from some editing but these historic days in Cyprus are expertly crafted. I have just finished reading Egby's book. It is very good. I am always amazed that authors can take, say, ten characters and move them around in a narrative in a way as to make a good and cohesive story. It is like a painting, or a jigsaw puzzle, all the bits and pieces have to mesh. And Bob has done this in spades. In addition he has seamlessly blended in the history of the country. Some authors that I have read use history as a separate and distinct feature of the story - an add-on. The players are fully developed and stay in character throughout. This book is among the best fiction or non-fiction that I have read. It reminded me very much of " Corelli's Mandolin." Highly recommended. Booksellers please contact LSI/INGRAM in the U.S. & U.K.
Robert's Author Page at Amazon U.S.
Robert's Author Page at Amazon U.K.